The Fiji Democracy and Freedom Movement says it has grave concerns about the lack of news and coverage by Fiji’s local media of the whereabouts of former parliamentarian, Peceli Rinakama. Rinakama, who is from the highland province of Naitasiri, was last seen on Friday March the 5th following the sentencing of the Province’s Paramount Chief, the Qaranivalu, Ratu Inoke Takiveikata. Takiveikata was charged and found guilty by the illegal regime’s appointed court, of conspiring to kill Commodore Bainimarama. In a statement, the Movement says it has confirmed with Rinakama’s family members in Fiji that he has not returned nor do they know of his whereabouts since he was arrested by the Military last Friday. It's believed Rinakama could not hold back his emotions and anger at the way his chief was arrested, charged with trumped up charges, unfairly tried and sentenced to prison, that he verbally lashed out at soldiers gathered outside the Suva High Court complex following the sentencing. A few minutes later, he was arrested by soldiers at the Suva home of Takiveikata and has not been seen or heard from since. Rinakama was part of group that had gathered at Takiveikata’s residence in the Suva suburb of Toorak. The Group had gone there following the sentence hearing to console Takiveikata’s family and were just about to partake in a social kava drinking session. 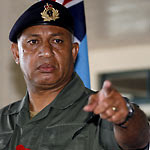 The Fiji Democracy and Freedom Movement says it is deeply concerned, given the Fiji Military’s reputation in handling people they have taken into custody since Bainimarama (pictured right and below) took over as Commander of the Military. 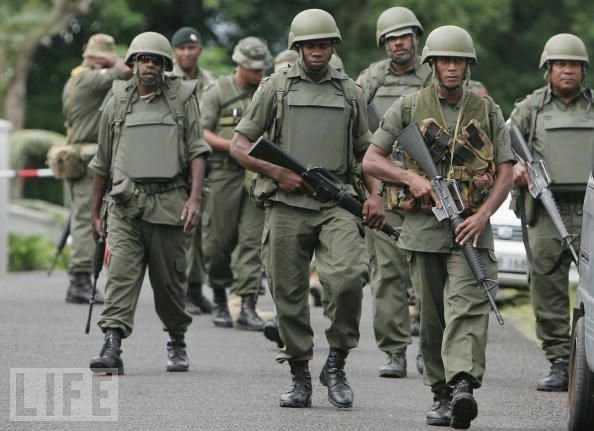 The Movement is concerned that it has been five days and the Military has once again reacted predictably to any voice of dissent against the illegal Bainimarama Regime and the Fiji Military. In 2000, following the failed November Mutiny of special force soldiers known as the CRW Unit, and following their voluntary surrender, these soldiers were brutally beaten leading to the death of five and the hospitalisation of many others. The National Director of the Deposed SDL Party of Prime Minister Lasenia Qarase, Kinivuwai has been arrested and detained by soldiers on more than twenty five occasions since the December 2006 coup. The systematic arrests by the military has also resulted in the death of Mr Nimilote Verebasaga and nineteen year old Sakiusa Rabaka. There are even claims that the death of escaped prisoner, Josefa Baleiloa, was due to beating by soldiers upon his arrest. These soldiers were reportedly masquerading as police officers and were part of the Police Group that went to arrest Beleiloa. The Movement says it's mentioned these deaths and human rights violations to highlight to the World that Rinakama risks suffering the same fate as those that has been taking into custody by the Military in the past and the deafening silence of the Fiji Military five days after Rinakama’s arrest is a major concern. Naitasiri - full moons & rugby. Given these peoples well known past record whoever thought putting their Turaga in prison really want their collective heads examined - really - what can possibly go wrong? On a more serious note - if the inevitable does happen - what does the military intend doing? Frank has chosen the way in which his demise will come about. In 2007, as you already know, I commented on Fiji times online comments section ( from which i was subsequently barred ) that the death of the C.R.W. Soldiers in 2000, was murder ! A reply came back saying that it was not murder, as it was deemed by the Military to be a time of WAR ! Well, War is defined as armed conflict, and that means that Fiji is indeed in and has been in a State of War, since December the 5th. 2006. So, under these circumstances, it would be acceptable to fight fire with fire and where Frank Bainimarama has chosen to fight with guns, then he should be repelled in kind, with guns. Remember, Frank Bainimarama has chosen the method by which this WAR should be fought ! Perhaps his son might be the 1st. casualty, though I hope not. Has anyone thought of kidnapping Frank's Family ? This indian supported coup has done too much damage to Fiji. All those supporting this coup which is systematically bashing and murdering Fijians need a taste of their own medicine. This is state sanctioned brutality. Mark Manning has clearly abused the content policy for blogspot by promoting armed conflict and putting forward the idea that someone kidnapp Franks family. Mark has abused his right to post comments on this blog and should be banned. The editors of this blog should also be assamed of themselves as they screen all posts before listing them. Mark Manning's views are not those of Coupfourpointfive. More importantly, where is Peceli Rinakama and is he alright? Mark don't do it - couldn't afford to feed them. What content policy? 4.5 posted your comment too. MM can make these comments because kidnapping and torture is what the army is doing RIGHT NOW. But this doesnt make it right or fair. In any event, kidnapping Bainimarama's idolent family is not a particularly clever way of getting Bainimarama to do anything - he is already as crazy as it gets and is unlikely to respond in a reasonable or predictable manner. He would probably just arrest everyone in Fiji then and have everyone interrogate eachother. I think a point that MM may have been making is that Bainimarama and his goons have been doing all these sorts of things to people in Fiji and it may not have occurred to him (or to you?) that it is possible for this to happen: i.e. you reap what you sow. 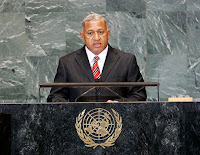 Bainimarama has had a good season of sowing violence, discontent and repression. Following the analogy, imagine what a bumper crop he is going to get at the end of it all. I don't think it will be pretty, but it won't be directed at his family.